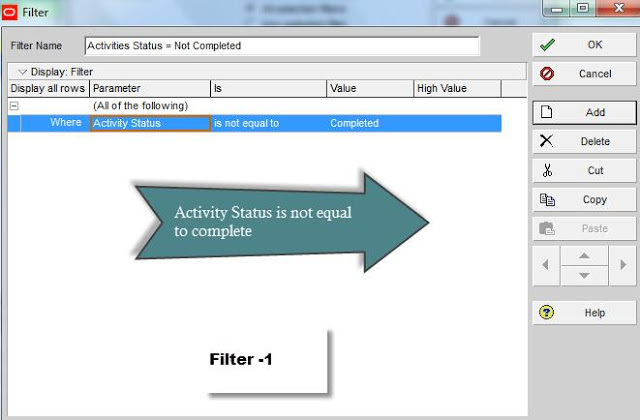 Activity with no predecessor or successor in the schedule does not drive the whole project. With the exceptional case, there may be some activities without predecessor or successor such as project start milestone, project finish milestone and an external link activity such as civil work completion of other project. For example; equipment delivery on site date (equipment supplied by Owner/EPCm Contractor) could be an external link if you are a Constructor with both of you and Owner/EPCm schedule are internally linked. 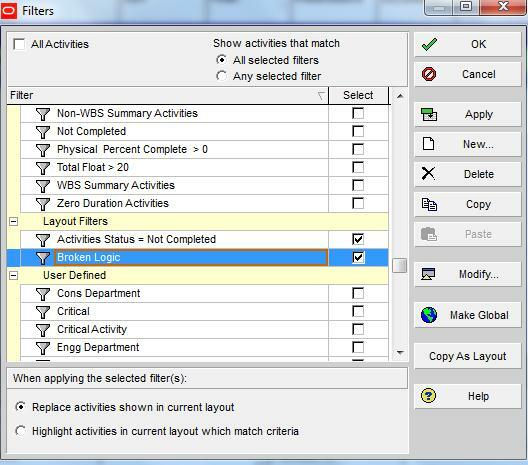 A quick way to identify the broken logic and external date activities is to create a layout and run the report as and when required. 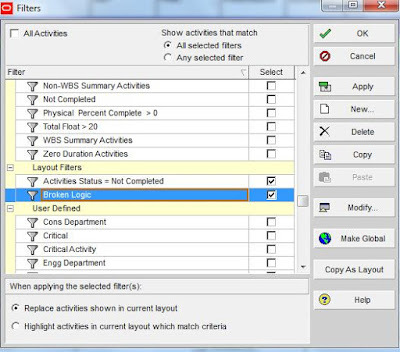 Primavera P6 imposed constraints when the relationships linked to two projects lost during exporting and importing process but you are not able to see them in the activity details window and constraint date column unless you add (External Early Start/External Late Finish) dates in the activity columns. If the external links have been identified in your project, that means they are broken logic activities with no predecessor. I like the article published by Ron Winter and F. Burak Evrenosoglu’s “Much Ado about Dates” Understanding P6 Date Information” in which he has explained more about external dates. 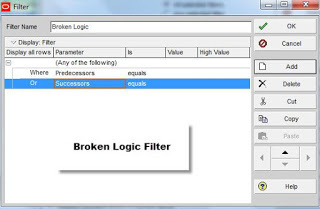 Select the Parameter "Any of the following"
then add the Parameter "Predecessors" is "equal" value "null" (leave it blank). Do the same for Successors. Finally, Select the "Activity Status Filter" and "Broken Logic Filter"
For those who do not wish to spend time to build the filter and layout, download the Primavera P6 layout to find external links and broken logic activity. Then, import it back to your project layout. You should find the layout as below when you run the layout.